pdf2cad To Go is perfect for CAD/CAM professionals who need to use a license in the office, at home and on the client’s premises. 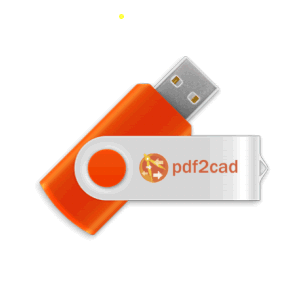 This handy USB includes a Home/Office license of pdf2cad that can be installed in up to three locations for use by a single-user plus, the software can be run directly from the USB drive. Just pop it in any PC and start working. It includes ample space to save work in progress and your collection of converted files. With pdf2cad To Go, you will have great flexibility in how and where you use pdf2cad. It’s always available on your PC or in your pocket. pdf2cad is the premier solution for converting PDF, EPS and Adobe Illustrator files into DWG for AutoCAD as well as DXF, the industry-standard, universal interchange format. Conversion to the HPGL plotting format is also included. For more information on pdf2cad, visit the pdf2cad product overview page.